The 2015 Commonwealth Youth Games took place in Samoa, 9,500 miles away, and 40 hours travelling time from leaving Heathrow until landing at Apia airport in Samoa. This was the 5th Games and the first time archery has been included. The Games contained nine sports of which Team England were represented in eight. Fifty six Commonwealth countries attended the Games leading to approximately 1,000 athletes taking part, with Team England making up 80 of those athletes with a further 20 staff supporting. After a robust two-stage selection process, Joe Ground and Lizzie Warner were selected to represent England earlier in the summer. I was fortunately appointed by the English Archery Federation as Team Leader and Adam Guest as reserve. As always Commonwealth Games England (CGE) prepared well in advance carrying out reccies to Samoa and providing workshops for all 8 England team leaders. After much preparation Team England assembled at Heathrow T3 on 31st September, all in team kit – and it was a magnificent sight! Our route would take us to Hong Kong and Auckland before touching down in Samoa at 20:30 on Wednesday 2nd October. The other side of the world IS a long way! We were greeted by the CGE staff at the airport and taken about 40 minutes along the coast to our accommodation. Our team was split over two hotels with a gap of 30 yards in between. Even though it was dark we could see that it was all dressed in England flags, bunting and banners. Most of the team awoke early the next morning to temperatures of 30+ degrees, beautiful clear blue skies and the sounds and smells of an unfamiliar country. After breakfast all the athletes had an interview with the team doctor and a familiarisation session, before being introduced to our driver who would stay with us throughout our time in Samoa. After this we were free to do as we wished so naturally headed straight to the archery venue for a look around and then onto the rest of the sport park to get our bearings. Lunch for all athletes and officials was held in one large open sided hall which allowed a nice breeze to flow through. Our first lesson at lunch was not to have salad, as this light breeze would blow it straight off the plate! Funny to watch, but not when it’s your lunch going in all directions! On the first day the hall was quite quiet as there were still lots of teams to arrive on the island, however over the coming days the hall would become a very noisy, active and colourful place. We had booked a practice session at the field for the afternoon. When we turned up we then had to find the practice field and assemble it! Work on the whole venue was still in progress and continued to be right up to qualification day. The practice field was set in a field about 100 feet higher than the main field up a windy track. It could have been an airfield as it was a great expanse of flat open grass. The targets were foam and stands were all brand new. Joe and Lizzie had a good session considering they were still tired from the journey, with only a couple of other archers joining us from other nations. That breeze from the dining hall was more of a wind on the practice field but we had no flags to help us. I enquired about them but was told they would be coming – this ended up meaning they would arrive on qualification day. To solve this Joe donated an old arrow and we took a piece of England bunting from our driver’s car and made our own flag – problem solved! Over the coming days others followed suit and we had a nice display of national flags above the targets! Our routine over the next week stayed much the same; two practice sessions a day, morning and afternoon. That breeze was ever-present and was both a joy in keeping the temperature down and a pain for Joe and Lizzie to constantly practice in. What was noticeable over the days was how the Team England athletes from all sports started to integrate with each other. They would sit and eat together, share stories and photos and talk about each other’s sports and the coming competitions. In the evening after food, if not training they would sit and play cards or board games together. Did I forget to mention we had no Wi-Fi access except to tether from my phone and call cost?! If you had a Samoan SIM card calls to the UK were about £10 a minute. As the days went by we watched the main field being assembled, a slow process as those doing it were not archers just volunteers assigned to the sport. Practice went well for Joe and Lizzie as they became accustomed to the wind and heat conditions. As more and more came to practice there was a real buzz about the venue. For me it was great to catch up with some old friends and to make some new acquaintances. 16 nations were represented for archery with a broad spread of standards and equipment. The Samoan archer was using an old wooden take down bow that I learnt to shoot with 30+ years ago! However it’s about the archer rather than the equipment as the Samoan would go on to prove later in the competition. After the third day the World Archery Technical Delegate, Carole Hicks, arrived and there started to be a lot more action in the construction of the venue and adjustments to the practice field, chairs and tables, water, repairs to the stands and a timing system with a DOS appeared very quickly. The days seemed to pass very quickly and soon we were at official practice day, all in our KUDOS team kit and I will say the best looking on the field. It was good to see everyone at the same time and see how people were shooting. England passed the equipment inspection without any problems but as the day went on it became clear that some nations had very little experience of this type of event or competition format, but with the aid of the two very helpful judges everyone was steered in the right direction. We left the field after a short afternoon session confident and looking forward to the days ahead. The qualification round in the morning started 30 minutes late due to the judges not being on the field, their drivers had gone AWOL. Lizzie and Joe both shot well, ranking 2nd in their respective categories. We then had a two hour break before we started the mixed team head-to-head matches. This was a non Commonwealth medal event but a good addition to the event. Countries were mixed together according to their ranking position. Lizzie was paired with a lad from Mauritus and Joe with a girl from Fiji, Marilyn Elder – the daughter of Robert Elder who competed for Fiji in archery at the London Olympics. Once everyone understood the format, and after a few practice runs, the matches started. Joe unfortunately was knocked out in the first round, but the combination of Lizzie and Aurielen from Mauritus was working well and they got through to the semi finals – which were to be shot through to medals the following day. This meant another early finish from the field. Some sports competitions had already started, and the first medals of the Games had been won. England putting up the first one, a gold in the javelin. Each evening at the Team England hotel a ceremony was held with everyone present to acknowledge those who had won medals that day and put their cardboard medal up on the Team England Medal board. A powerful experience in front of your peers! Day 2 started as every other day – hot, windy and clear blue skies. Today started with the semis and medal matches for the mixed team round. Lizzie’s first match went well and they were into the bronze medal match. This was close but they triumphed to win the bronze. A great result but we were careful not to get distracted from the main event. In the afternoon the individual match play continued, Joe and Lizzie having byes due to their good ranking position. Day 3 saw some great matches with shoot-offs as the competition progressed. Joe had maintained his form throughout but got knocked out in the quarter final matches by the Tongan archer Arne Jensen who, we were to learn that day, had 24 brilliant arrows. This was a real blow to Joe and he took it hard. He was not expecting a medal but knew that his form could put him in contention. Lizzie fared much better, even with having a couple of misses in her matches due to wind blowing her arrow off the rest. This did not faze her at all and she shot some lovely arrows to see her through to the semi-finals the following day. Day 4 was tough for Joe but he came out for breakfast in good form to support Lizzie in any way he could, which I know was much appreciated and made a difference. During the matches Joe was in the hide to score Lizzie’s arrows, and when not required there I gave him my camera and many of the photos you may see from Samoa are his as he captured the essence of the competition and Games. Lizzie won her semi-final putting her into the Gold medal match. At this point all the Team England staff arrived to watch – Chef de Mission, Chairman and CEO included. Individual representatives had been along at various points throughout our stay but this was the full works. In the Gold Medal match Lizzie moved into another gear – she was relaxed, calm and enjoying the moment. The match was close but the Indian top seed Prachi Singh came through to win the Gold. Match win confirmation was slow to come from the target judge but celebrations had started on the shooting line with handshakes and back slapping. Lizzie remained calm and I don’t think she could take in what she had achieved for what seemed like ages, but probably was only minutes. We eventually left the field for lunch and word had already got around the rest of Team England as Lizzie was recognised and congratulated in the dining hall. We returned in the afternoon to watch and support the men’s medal matches. I felt for Joe and you could see he was finding it difficult but he was a real ambassador for England by congratulating the winners and supporting Arne Jensen as he crashed out of his match missing out on a bronze medal. The medal ceremony was held soon after the completion of matches with the president of the Commonwealth Games Federation, Louise Martin CBE, and her husband presenting the prizes. Many photos and goodbyes were said as we left the field for the last time. That night I was extremely proud to be able to introduce Lizzie to the rest of Team England at the medal ceremony back at our hotel. It was then that I think she realised she had joined a very elite group of people! The next couple of days were filled with visits to local school, a trip around the island and the closing ceremony. This had a great party atmosphere with a grand finale of fireworks. Everyone then moved back to the sport park for the disco/party afterwards and to let off some steam. The following morning it was a case of packing, saying our goodbyes and back to the airport for our long journey home. It’s always sad to leave a place that has been so welcoming and provided such great memories but there is a time when you look forward to getting back home and sharing it all with your friends and family. KUDOS champions sport so the people who play can develop their technical and personal skills. We encourage new people to take part or support their archery club. 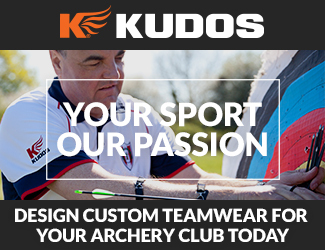 KUDOS supply custom archery kit that is designed to meet the demands of the sport in matching styles across all garments including archery shirts, archery tracksuits, archery hoodies and archery jackets.